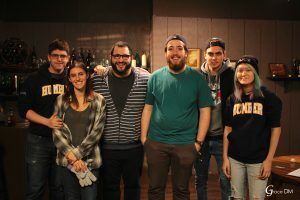 I was the Director of Photography of True Girth. I was in charge of three departments; Camera, Lighting and Gripping. 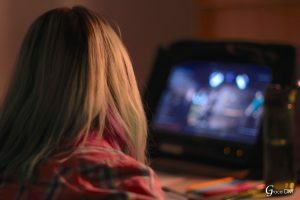 A director of photography have to understand the importance of lights and camera framing that play into creating a visually compelling composition. It was the first experience being in charge of one of the biggest departments in production, and working within a bigger scale crew. It was slightly chaotic initially, but I eventually got used to, and thrived in it. 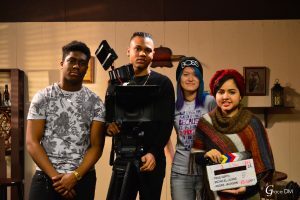 We may be taught in class and lectures on how to make a film and respecting the hierarchy, but by experiencing it first hand is the key in learning what works within a film crew. It was necessary to go out, shoot a film and learn from our mistakes. A very important lesson that I learned being on set of True Girth is that, communication is key. We must always be in communication with one another, never assuming. When in doubt, always ask. There was also the time issue that we faced. Having an additional page of script and a big cast of ten people, everything was under a time crunch. Often when I wanted to make lighting changes, I was told I did not have the time. I’m happy that I was able to juggle these roles and performed well, despite the tremendous pressure. 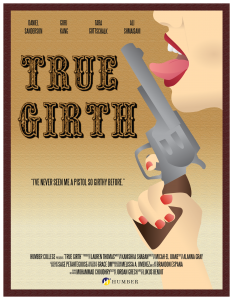 True Girth was screened at The Royal Cinema, Toronto. See more behind the scenes of True Girth.